This move makes sense for all kinds of reasons. First of all, both DuckDuckGo and Apple have made user data privacy a priority, making them easy partners. Each also addresses a need for the other. 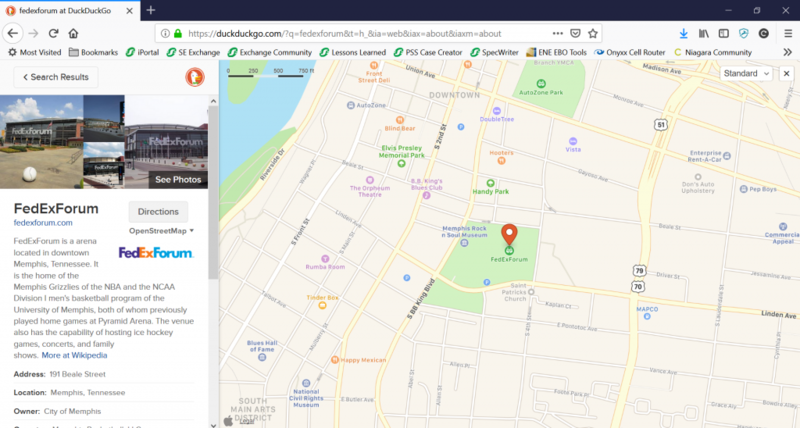 Unlike Google, DuckDuckGo doesn’t have its own maps and doesn’t have the advertising revenue to go out and build its own or buy an existing product. Similarly, Apple doesn’t have a search engine to help them build out their Maps service. While money isn’t an issue for them, a search engine isn’t a fit with their business. However, Apple’s interest in self-driving cars makes Maps incredibly important for them, long term. All of these goals seem to converge quite nicely. The big win for DuckDuckGo is that they now have a consistent interface across most of their mapping requests. I say most because they still offer users a choice of OpenStreetMaps, HERE Maps, Google Maps and BING for directions. This is interesting since Apple’s MapKit JS, which is the mechanism that makes Apple Maps available in a web browser, does allow for directions. Either that wasn’t part of the deal, or just hasn’t been implemented quite yet. Either way, this is still an improvement for DDG, as they used to have a hodge-podge of mapping services in different views, depending on the type of request. The agreement between Apple and DuckDuckGo is confidential and we don’t know if any money is changing hands here. Apple makes MapKit JS available for free with limitations, but that wouldn’t make sense for a search engine. Because we don’t know the terms, we also don’t know exactly what Apple’s getting out of the deal. It could be money. It could be additional exposure for Maps. However, I can’t help but wonder if they are also looking for an additional data stream to help them improve Maps. I know this would raise privacy red flags, but Apple likely isn’t concerned with the same data that Google is via mapping. Google wants to know about you- where you are going and what you are doing. It’s all about serving you ads that make the most sense and tailoring their services to you. Apple doesn’t need this data for specific users. They just need better mapping data in general. They need more and better POI information. They need to rank the popularity of locations and points of interest by the amount of requests. If it is part of the deal, Apple could use that data anonymously since their focus would be on the end results, not who is making the query. However this deal is constructed, it is good to see Apple continue to push its services outside of the walled garden into the wider world. The more people that use Apple Maps, the better it will become. Getting it included in one of Google’s main competitors is definitely a win for Apple. Hopefully this move will also help DuckDuckGo to polish and expand its alternative search engine. As good as Google is, the world needs viable alternatives and DDG is one of the few out there at the moment.